Is the U.S. Expecting Too Much Out of Iraq’s Elections? Iraqi Prime Minister Haider al-Abadi, left, and Shiite cleric Muqtada al-Sadr in the heavily fortified Green Zone in Baghdad, Iraq, May 20, 2018 (Iraqi government photo via AP). To judge by much of the expert commentary so far, last week’s parliamentary elections in Iraq were a setback for the United States. The winning coalition, led by the cleric Muqtada al-Sadr, has been viewed as anti-American—but also not quite pro-Iranian, given Sadr’s reinvention as an Iraqi nationalist. 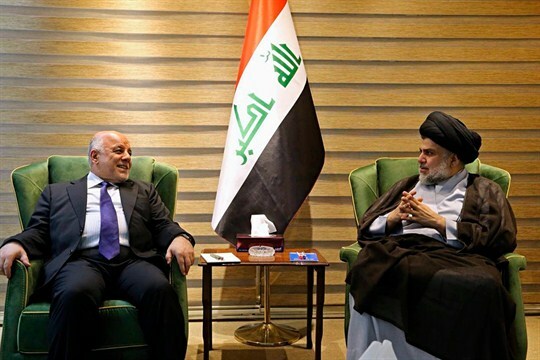 The affable incumbent, Prime Minister Haider al-Abadi, came in third, behind an explicitly pro-Iranian coalition.